Jack-o’-Lantern Press recently sat down with Davy Crockett’s Ghost to discuss his new tell-all book, “It Wasn’t a Bear; It Was Friggin’ Bigfoot.” Crockett’s Ghost claims Disney gave him a bad rap in the TV shows and their merchandise, and the frontier man’s new book will set the record straight. Jack-o’-Lantern Press: Mr. Crockett, who are you really? 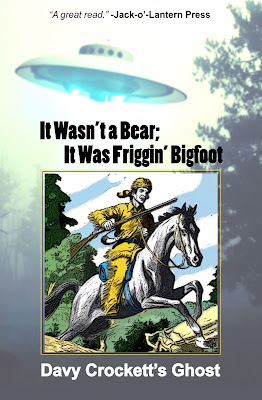 Davy Crockett’s Ghost: I’m Davy Crockett, way more than just king of the wild frontier. JLP: And this book you wrote will set the record straight? DCG: Darned right it will. Let me get right to it -- I wasn’t born on just any mountaintop in Tennessee. I was born on a mountaintop with a coven of witches. And I didn’t kill a bear when I was only 3. You don’t get bears living next door to witches. You get Bigfoot. And I destroyed Bigfoot in a fistfight and brought his weak carcass back to my moms to use in their evil potions and stews. JLP: So in the “Ballad of Davy Crockett,” made famous in the Disney TV show, the lyrics say you fought single-handed through the Injun war. What of that? DCG: Not Indians. Native Americans, please. But that’s all lies. I never fought any Indians. I love Indians. I fought Martians. I was working in the woods, whittling away on this idea I had to develop a global computer network, when Martians came down and kept me from my breakthrough. I had to put down my motherboard and take down this threat that would’ve eventually destroyed the world. I fought single-handedly -- that was true. I mean, no one was gonna join in a fight against a Martian army back in those days. All you had were bows and arrows and some pretty lame firepower. DCG: Darned right it is. That’s why I wrote this book. JLP: Tell me about going off to Congress. DCG: There’s another misconception. I didn’t just fix up the government and laws like the song about me so inaccurately says. In 1826, when I took my seat in the 21st US Congress, I crushed politics. Look, I was a three-time Congressman. I was a friggin’ beast. JLP: Without giving away the ending of your book, you didn’t actually die at the Alamo in the Texas Revolution on March 6, 1836, did you? DCG: No, I didn’t, Jack. The Martians came back to get even with me. They abducted me and I had it out with them on their spaceship while traveling back to Mars. After showing those idiots who was boss and later fixing a few ridiculous features on the ship, which I documented and sent to NASA years later, basically giving them the tools they needed to get the Apollo program up and running . . . Wait, where was I? JLP: You were talking about not dying in the Alamo and being taken to Mars instead. DCG: Right. Except I took them to Mars. After killing them and fixing their ship, I decided I wanted to see what this planet Mars was all about. When I got there, I saw some things I could improve, so I stayed, made some huge enhancements to their second-world world, and I even picked up where I left off on my whole Internet project. JLP: So you claim you invented the Internet, right? DCG: I don’t claim I invented it. I invented it, Jack. I sent all the plans down to Earth for you guys to build and give me credit for -- maybe clear my name -- and you guys built it and passed it off as your own invention. Am I ticked? You’re darned right I’m ticked, Jack. That’s why I wrote this book. JLP: So how’d you really die? Pardon me if you didn’t die. I only assume you died because you’re a ghost right now. DCG: Yeah, I died, but I died by choice, Jack. I didn’t get killed, that’s for sure. Ain’t no one gonna get the best of me. I was sick of being a human and decided that being a ghost would be pretty tight because I could have all the time I needed to accomplish all the stuff I wanted to accomplish. You should see the new iOS I’m working on for smart phones right now. It’s siiiiick, straight up O.G. And I got news for you -- I am the original gangsta. JLP: Well, it looks like we're out of time. One last thing -- I understand you’ll be doing readings from your book on this book tour. Where can we expect to see you? DCG: Well, there aren’t many bookstores left in the world thanks to the Internet. You can ultimately thank me for that. You’re welcome. But since I’m a ghost, I can’t just show up anywhere anyways. Most people can’t see or hear me. So I’m gonna make some appearances at haunted houses, cursed taverns, evil castles and such to read from my book to those with ghost-hunting equipment -- that’s the only way people will be able to make contact. I’m hoping to get on a bunch of those ghost shows so I can clear my name once and for all. JLP: Well, thanks, Mr. Crockett. It was a pleasure speaking with you. 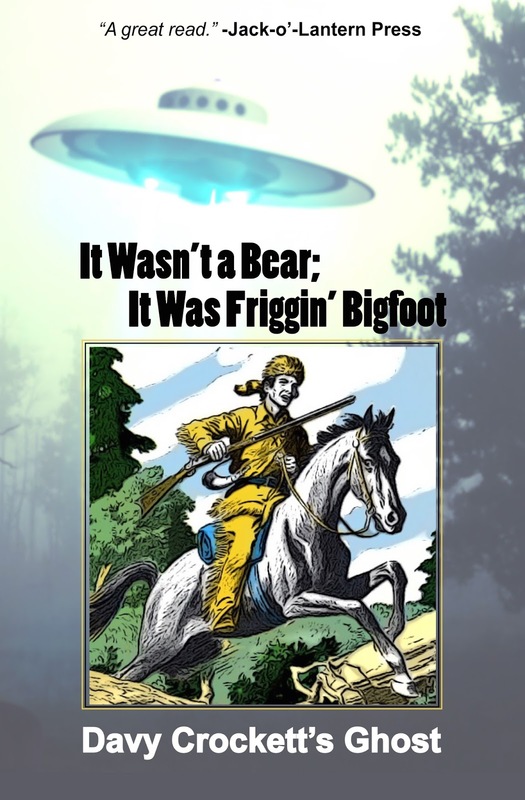 Davy Crockett’s new book, “It Wasn’t a Bear; It Was Friggin’ Bigfoot,” is not available for purchase anywhere. The ghost is currently whittling away on an idea to telepathically transport the work into everyone’s head.